Sidney native Grace Frantz, center, is surrounded in Ehtopia by children wearing dresses made by volunteers in the Holy Angels Wrapped in Gods Love project. SIDNEY — Holy Angels Outreach Committee has scheduled three Wrapped in God’s Love sessions. Wrapped in God’s Love is a project in which volunteers sew items for needy children here and abroad. The first session has been scheduled as a cooperative effort by the Twinning and Outreach Committees for Feb. 2 from 10 a.m. to 1 p.m. at the Sidney Knights of Columbus Hall, 1300 Fourth Ave. All items created will be sent to Vladivostok, Russia, a very poor area which has been adopted by Holy Angels as a twinning parish. Children up to 5 years old, many living in orphanages, will be recipients of flannel baby blankets, bibs, burp cloths, long pants, hats, scarves and fleece blankets made during the event. A display and video about Vladivostok will be available. Refreshments will be served. The Shelby County YMCA will be the site for the second session, Feb. 15 from 1 to 3 p.m. Projects listed above will be available with the addition of dresses and shorts for children, rosary making and knitting and crocheting projects. Items made will be donated to Compassionate Care, Wilson Pediatric and Hospice units, as well as sent to impoverished people elsewhere. The final session is scheduled at Maria Stein Shrine, 2291 St. John’s Road, Maria Stein, March 2 from 1 to 3 p.m. The same projects will be worked on there. All projects are ongoing, so there are no deadlines, and people are welcome to make projects at home, also. There is a collection bin in the connector at Holy Angels, an enclosed area between the church and school. No reservations are needed for the free events. Participants are asked but not required to take sewing machines if they plan to sew or fabric suitable for children’s pants, flannel and fleece fabric in a of minimum 40 by 40 inches and long- or short-sleeved children’s T-shirts and fabric suitable for little girls’ dresses. 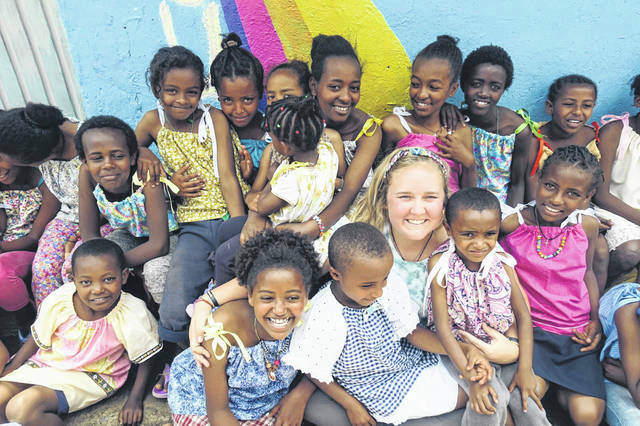 https://www.sidneydailynews.com/wp-content/uploads/sites/47/2019/01/web1_dresses-Ethiopa.jpgSidney native Grace Frantz, center, is surrounded in Ehtopia by children wearing dresses made by volunteers in the Holy Angels Wrapped in Gods Love project.